Soligenix, Inc. (NASDAQ:SNGX) recently published a review of the potential clinical applications for innate defense regulators (IDRs), including the company’s lead IDR asset SGX942. IDRs modulate the innate immune response, which is composed of both physical barriers (e.g., skin, mucosal surfaces, etc.) as well as specialized myeloid and lymphoid sensor and effector cells (Gasteiger et al., 2017). 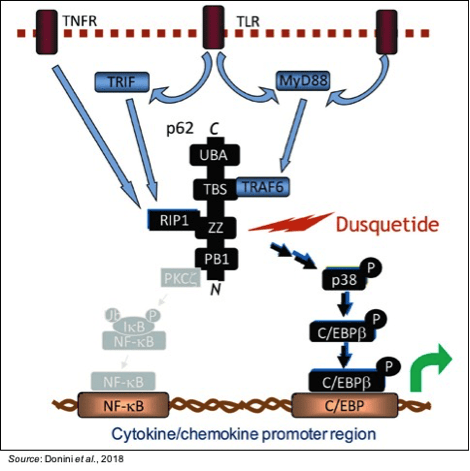 IDRs exert their effects through binding of p62 (sequestosome-1), which is involved in a number of different innate immune signaling networks (Yu et al., 2009). The following figure shows how p62 is involved in multiple signaling pathways and that upon binding by SGX942 there is subsequent increased expression of C/EBPβ (a transcription factor that controls expression of multiple genes involved in the innate immune response) but no modulation of expression of NFκB (a family of transcription factors that control the expression of pro-inflammatory proteins). The ability to activate the innate immune response without the inflammatory component has a number of important potential clinical consequences. For example, Soligenix is currently testing SGX942 in a Phase 3 clinical trial for the treatment of oral mucositis (OM). OM is an often-times debilitating side effect of chemotherapy and radiation treatments. The killing of tumor cells results in the subsequent release of damage-associated molecular patterns (DAMPs), which can activate the innate immune response. The inflammatory component of the innate immune response results in painful inflammation and can increase tissue damage and ulceration in the gastrointestinal (GI) tract and can also lead to opportunistic infections (shown below). This typically results in a patient’s inability to eat or drink and can lead to other serious side effects including hospitalizations and the ceasing of the cancer treatment. The following figure shows how the use of an IDR in the presence of an activated innate immune response can aid in the healing of tissue damage and ulceration in patients with OM. 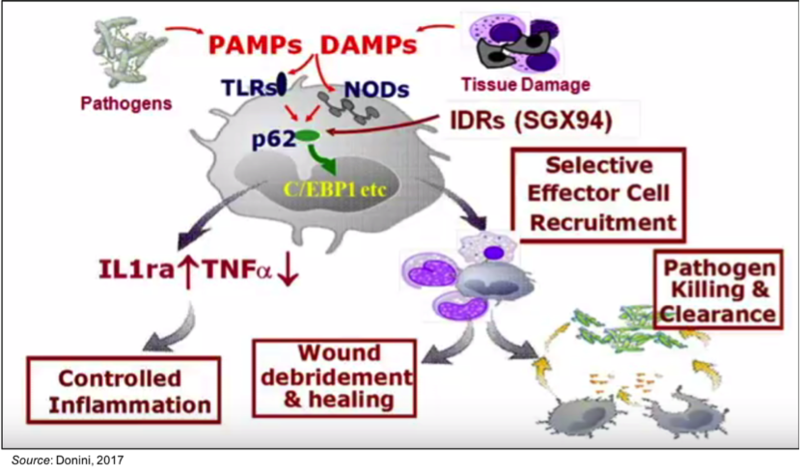 Whether activated by DAMPs or pathogen-associated molecular patterns (PAMPs), IDRs can modulate the immune response to selectively recruit the effector cells that will aid in wound healing and debridement while not activating pathways that increase inflammation. Soligenix has shown the ability of an IDR to protect against the develop of OM in multiple animal models as well as in a proof-of-concept Phase 2 clinical trial. The following figure shows the protective effects of SGX94 in different animal models of both chemotherapy and radiation-induced OM. In both instances, SGX94 was able to decrease the duration of OM by 50%. A proof-of-concept Phase 2 study of SGX942 in 111 head and neck cancer patients in 2015 (Kudrimoti et al., 2016) showed that administration of 1.5 mg/kg SGX942 reduced the median duration of severe OM by 67% (30 days vs.10 days for the placebo and SGX942 groups, respectively) in those patients receiving the most aggressive form of chemoradiation therapy (below left). In addition, there was a decrease in the median duration of ulcerative OM, which met the pre-specified threshold for significance of P<0.1 (below middle). Lastly, treatment with SGX942 appeared to increase the efficacy of treatment, as a greater percentage of those treated with SGX942 saw complete resolution at the 12-month mark than those treated with placebo (below right). 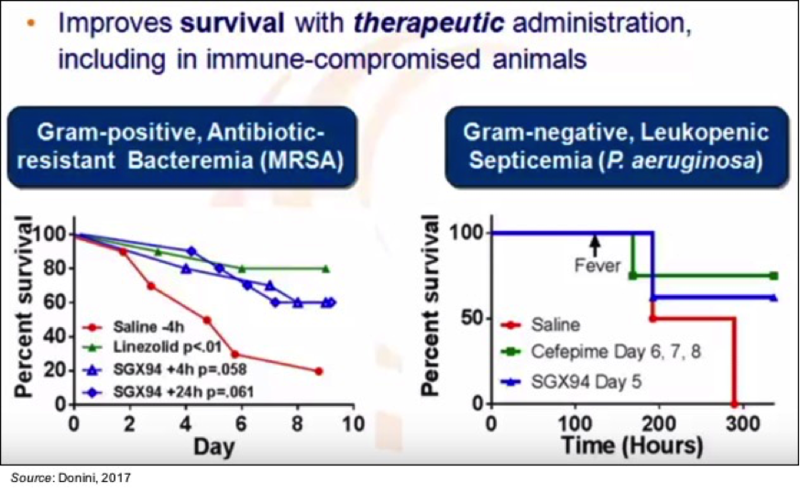 While Soligenix is currently focused on the use of SGX942 in patients with OM, another important potential application for IDRs is in their ability to augment the innate immune response in the treatment of bacterial infections. One of the biggest potential advantages of using IDRs to treat bacterial infections is that the offending pathogen does not need to be identified prior to the initiation of treatment. This is because the innate immune system can respond to both Gram positive and Gram negative pathogens, as shown in the following figures. On the left is a bacteremia model (with the Gram positive, antibiotic resistant pathogen Staphylococcus aureus) and on the right is a leukopenic septicemia model (with the Gram negative pathogen Pseudomonas aeruginosa) showing response to therapeutic treatment with SGX94. While SGX94 can be used as a single agent treatment in animal models, it would almost certainly be used in the clinic as an add-on therapy to standard of care antibiotics. 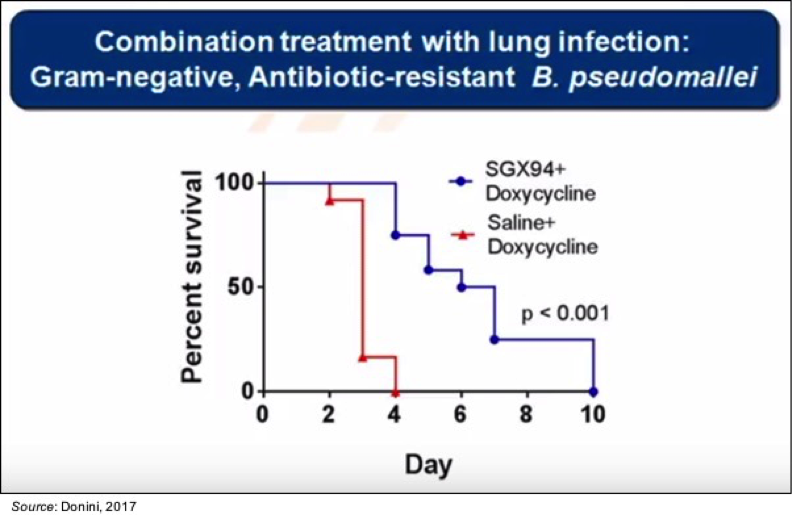 In this regard, SGX94 is capable of complementing the effect of antibiotics, as shown in the following figure where treatment with SGX94 has a positive effect on survival in a lung infection model with the Gram negative pathogen Burkholderia pseudomallei. In addition to having a survival effect, IDRs also help to clear an infection. The following figures show bacterial counts from two different S. aureus models and how the use of an IDR as a single-agent treatment (left figure) and in combination with vancomycin (right figure) results in a significant decrease in bacterial cell counts. Importantly, the results seen thus far with SGX942 and other IDRs include a benign safety profile, as there have been no reports of any type of serious side effects, systemic inflammatory response, or an effect on the adaptive immune system. Soligenix recently announced that the European Patent Office granted a patent that claims composition of matter of IDR analogs and expanding the IP protection for dusquetide. Similar claims are already patented in the U.S. under U.S. Patent 9,416,157. The potential for IDRs lies not just in OM, for which Soligenix is currently conducting a Phase 3 clinical trial with a data read out expected in the second half of 2019, but also for treating various bacterial infections. We believe the potential for IDRs in treating infections is currently under appreciated, particularly with their potential advantages, such as the ability to treat without regard to the identity of the infection or whether it is an antibiotic resistant strain. We are looking forward to the results from the company’s two ongoing Phase 3 studies over the next year, with positive results from either (or both) of those studies likely to cause a significant revaluation of the share price. Our current valuation is $8.50 per share.